She said she vividly remembers the time she and her friend approached their teacher and said they didn’t want to do the regular lessons in the class. Instead, O’Toole struck a deal with the teacher to sit in the corner of the classroom and complete more advanced pre-algebra worksheets in place of the routine curriculum. “She would give us worksheets, like pre-algebra worksheets, and we would just sit in the corner, laughing and doing math,” O’Toole said. 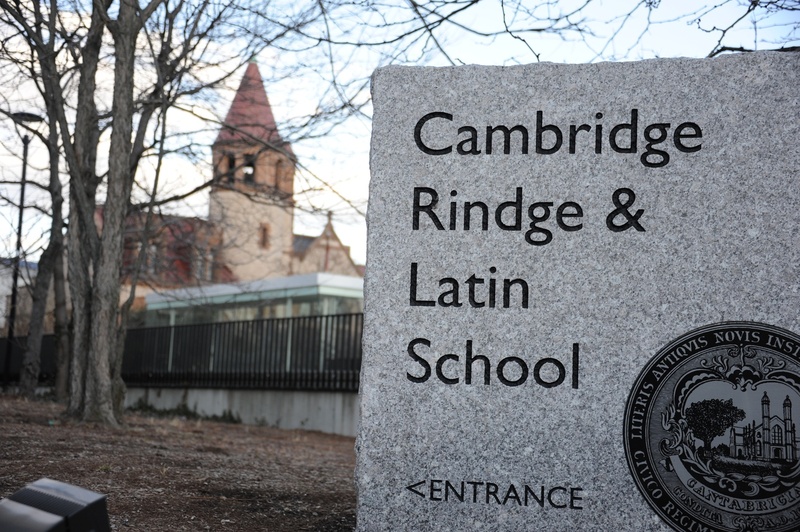 Cambridge Rindge and Latin School is the only traditional public high school in the Cambridge School District. O’Toole now attends Cambridge Rindge and Latin School, a public high school in Cambridge. Each year, several CRLS students find they have exhausted the school’s already extensive math curriculum. As a result, this year alone, 13 of these students find themselves walking a few blocks west to attend math classes at Harvard, and, in rare cases, starting as early as in their freshman year. While younger than the average Harvard math student, these high schoolers say they are able to tackle college math, despite a few challenges, and that taking classes at the College has positively affected their perception of Harvard. CRLS has an expansive math program spanning from Algebra I to AP Calculus, AP Computer Science, and AP Statistics, so the students that choose to pursue the challenge of taking math classes at Harvard typically have strong math backgrounds that allow them to accelerate through the high school’s programming. 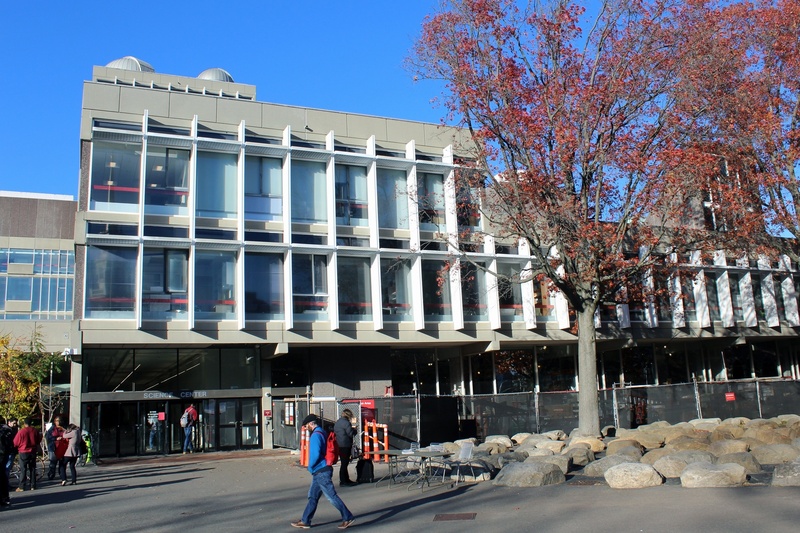 Jeff Gaglione, the Dean of Mathematics Curriculum and Program at CRLS, said that students allowed to take classes at Harvard have often completed the high school's curriculum. 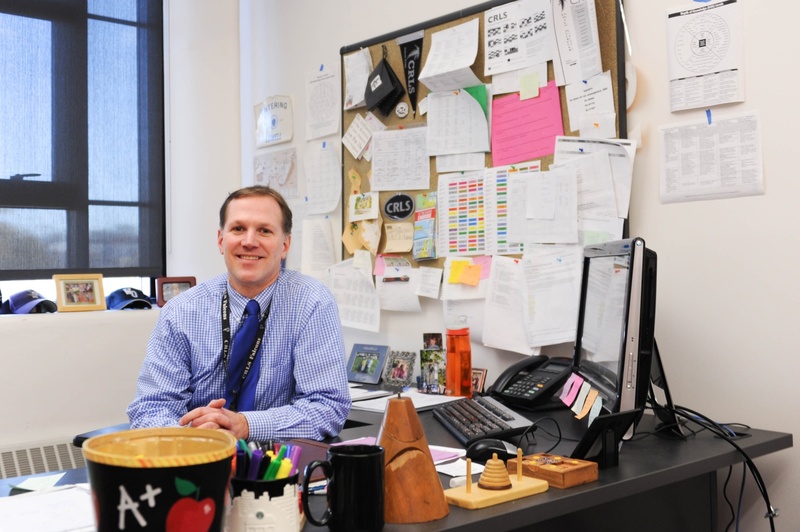 Jeff Gaglione, Dean of Mathematics at Cambridge Rindge and Latin School, poses for a photo at his desk Thursday afternoon. “We’re typically looking for students to exhaust our course offerings before taking Harvard classes, and it’s great that we have Harvard right near us,” Gaglione said. In particular, once the students complete the calculus offered at CRLS, many of them seek out the opportunity to take multivariable calculus at Harvard. “I was done with calculus by the end of sophomore year, and then it was like, I either don’t do math for two years or I come here,” Paloma J. O’Connor ’21, who graduated from CRLS in 2016, said. O’Toole said that due to the advanced mathematical coursework that she did throughout middle school, she was able to begin taking Harvard math classes her freshman year; most CRLS students that take math at Harvard begin later. “I’ve been taking Harvard extension math classes since middle school, but the first Harvard undergraduate class I took was Math 101: 'Sets, Groups and Topology.' That was freshman year of high school,” O’Toole said. Now a self-proclaimed part-time junior at CRLS and part-time homeschooled student, O’Toole has continued taking Harvard math classes. “Sophomore year of high school I took 21a and 21b so that’s multi and linear algebra, and then this year, I’m taking Math 122, which is Abstract Algebra, basically,” she said. While the difficulty of taking Harvard math classes may seem as though it would serve as deterrent to some students, Gaglione said that when students from CRLS take classes at Harvard, those classes are not factored into their GPA. Nevertheless, Harvard College classes that are taken during the school day still appear on students’ transcripts, and CRLS does award students credit for taking them. “We will put Harvard classes on students’ transcripts, but we do require that we get some kind of grade notification from Harvard itself,” Gaglione said. He said that professors at the College will typically write a letter to acknowledge that the CRLS student was in their class and assign them a final grade. CRLS students that take math classes at Harvard say they are faced with the challenges of adjusting to a college classroom environment long before their peers. For example, CRLS senior Jeffrey Chen, who is currently enrolled in Math 101, said that students are often responsible for emailing the Harvard professor and asking for permission to take his or her class. “You have to take the initiative yourself to go ask a professor, and that first time is always like, you don’t know what’s going to happen,” he said. O’Toole said that it can be difficult for CRLS students to learn to advocate for themselves, but professors are often willing to include them in their class. “Usually when somebody asks, I say yes. Often it’s been the case that other professors send me information and say that ‘I spoke to so and so, is it okay if he or she takes your class?’ And I say sure,” Hiro L. Tanaka, who teaches Algebra 1: “Theory of Groups and Vector Spaces”, said. Once a student has been accepted into a class, they face another hurdle: learning alongside students that are several years older than they are. “It’s really intimidating. Especially because when I go to section and stuff, people don’t always know that I’m a high schooler, so they’ll be asking asking me questions about my dorm and things like that, and I have to tell them that I’m in high school, and it’s like a big thing,” Dina Voevodsky, a senior at CRLS, said. O’Toole agreed, saying that she sometimes feels uncomfortable asking questions in her class. However, despite these difficulties, multiple CRLS students said that they have been able to develop collaborative relationships with their classmates, professors, and teaching fellows. For example, Voevodsky said that this year, she has began attending “Math Night,” collaborative office hours with teaching fellows where students work on problem sets together. O’Toole said that while she often works on homework with other students from CRLS, she also does problem sets with Harvard students. “I like wait outside the door of Leverett Hall to be swiped in by somebody else, and then I sneak in and go to Math Night,” she said. While Tanaka said that he does not feel the need to provide any special help to high school students in his classes, he did note the differences in their age, and consequently, the number of years they have been doing math. “You do have to be sensitive about the mathematical maturity that they have. For some reason, I think when we’re 20 and have done math for a long time, some people think a different way from when they are say, 16, so you do have to keep that in mind,” Tanaka said. Harvard's Science Center, home to many classes in the Math Department. While these high schoolers have already gotten to know the ins and outs of the Science Center, all of the current CRLS students interviewed said they don’t want their Harvard education to end in high school. Chen, O’Toole, and Voevodsky are all applying to the College this year. “It’s kind of better than a college tour. You’re actually in the class. You’re actually experiencing the people there. People are generally welcoming and understanding of your situation and that’s really nice,” Chen said. Voevodsky said that the sense of community she gained from taking Harvard classes factored into her decision to apply. “I really like the collaborative environment and the professors. I like all the students, and I’m definitely applying to Harvard, so I mean we’ll see, but I think it’s positively influenced me,” she said. While Voevodsky and Chen both said that they were considering studying math in college, O’Toole said that while Harvard classes have facilitated her love of math, she is also drawn to other disciplines. “I’m not sure that I would be able to spend my career just thinking about pure math, even though it is fun, and I enjoy it as a part of my education,” O’Toole said. For O’Connor, who already attends Harvard, she noted that taking Harvard classes prior to applying helped assuage her fears about the seeming impossibility of achieving success in a Harvard class. “It definitely gave me the impression that I wasn’t wildly out of my depth, so it wasn’t impossible that I could come to Harvard, and it wouldn’t be like I would have no idea what’s going on in every class,” O’Connor said. DANCING CLASS. - Mrs. L. J. Chandler's Dancing Class Tuesday, Oct. 4 at 8 p. m. Odd Fellows Hall, Cambridgeport. I remembered how fragile my future became as I watched votes go up for a man who held the fate of my undocumented community in his hands. I suddenly remembered that I had more to worry about than academics.